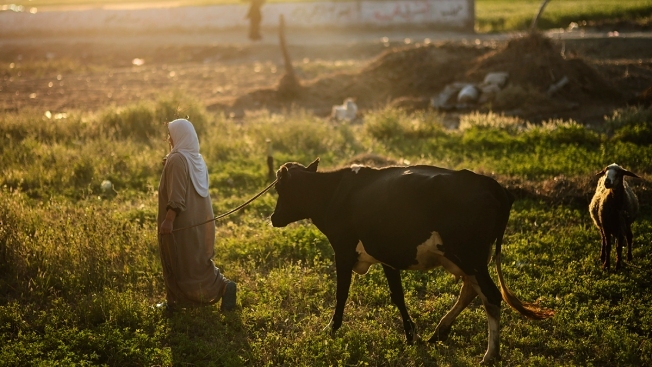 In this May 6, 2015, file photo, a farmer leads her cattle on her way home at the end of the day in the Nile Delta town of Behira, north of Cairo, Egypt. The heat feels relentless. Temperatures here in August regularly top 95 degrees Fahrenheit, and Sunday’s forecast projects thermometers will hit 100 F. In Ouargla, Algeria, the temperature spiked to 124.34 F on July 5 this year, the highest temperature reliably recorded on the continent of Africa. In 2016, Mitribah, Kuwait, reportedly reached 129.2 F, which could make it the highest temperature on record for the Eastern hemisphere and Asia. With blisteringly hot summers becoming a regular occurrence, climate change could soon push an environment that is uncomfortable into one that is unsustainable — particularly for countries along the Arab Gulf and in North Africa, NBC News reported.